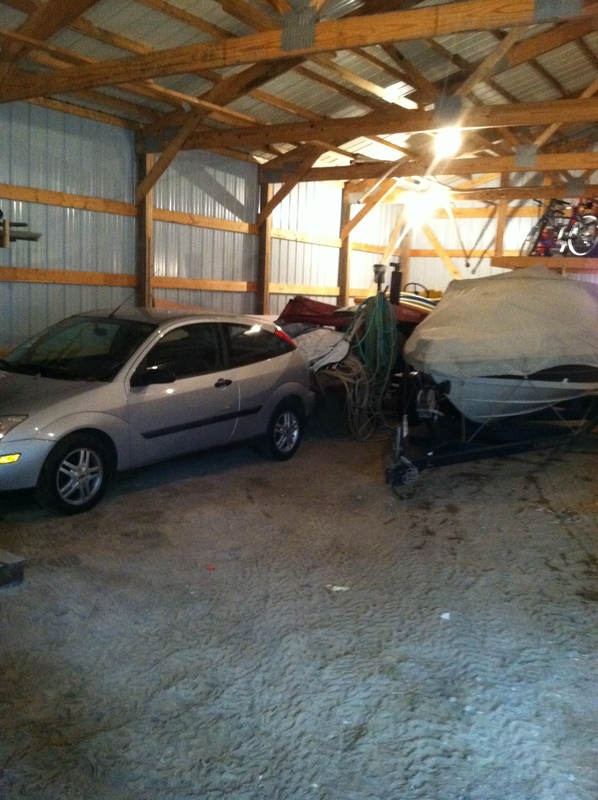 Jay manages to pack the shed pretty tight! 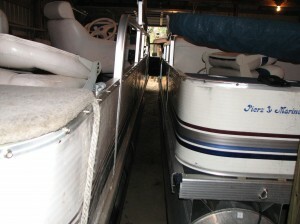 After making room in the shed for the pontoons we started the arduous task of stowing the boats. You would think that after 13 years we would have it down to a science but, apparently, we forget “how we did it last year” and have to re-learn where everything goes each fall. The day was really windy and raining so it was a *PERFECT* day to pull the boats out of the lake. 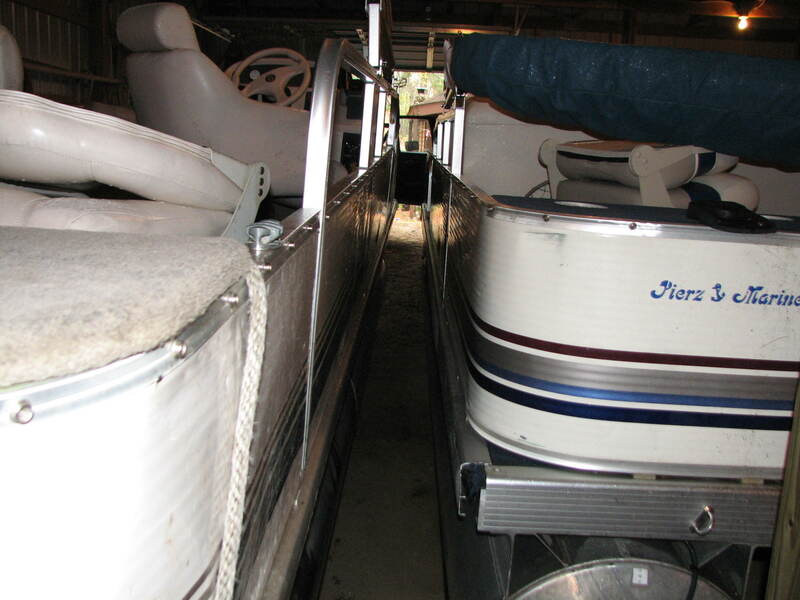 We had the first boat on the trailer and were getting ready to pull it from the lake when Jay made a speedy exit from behind the boat. 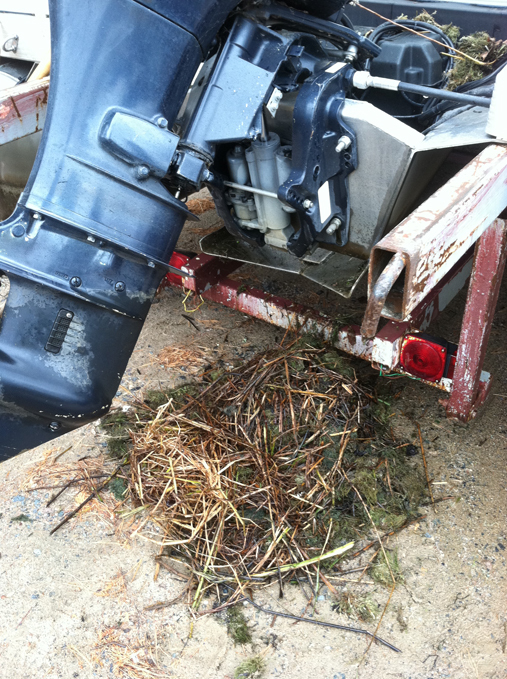 Apparently a muskrat had made a nest in the bottom of the boat and when Jay went around the backside of the pontoon to hold it in place on the trailer the muskrat was sitting on the battery looking at him. You’ll be relieved to know that he didn’t scream like a girl or anything. 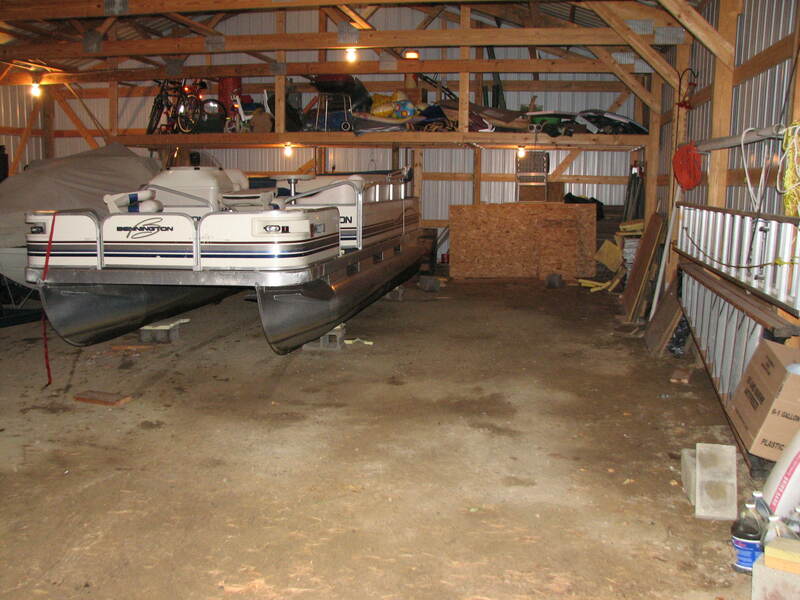 😉 We cleaned out the muskrat nest and maneuvered the pontoon into place in the shed before remembering that the reason we don’t use a 24 foot pontoon trailer is because it’s too long to get it out from under the pontoon once the boat is in place. Hmmmmm….not good. Remind me again: How many years have we been doing this? 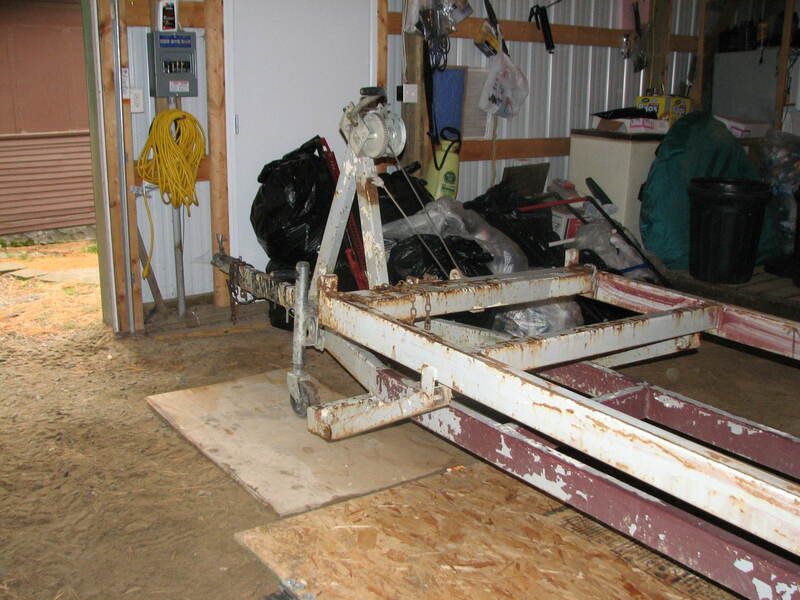 Anyway, we finally got the trailer out of the shed and back into the lake to pull out the second pontoon. Muskrats make a big mess! 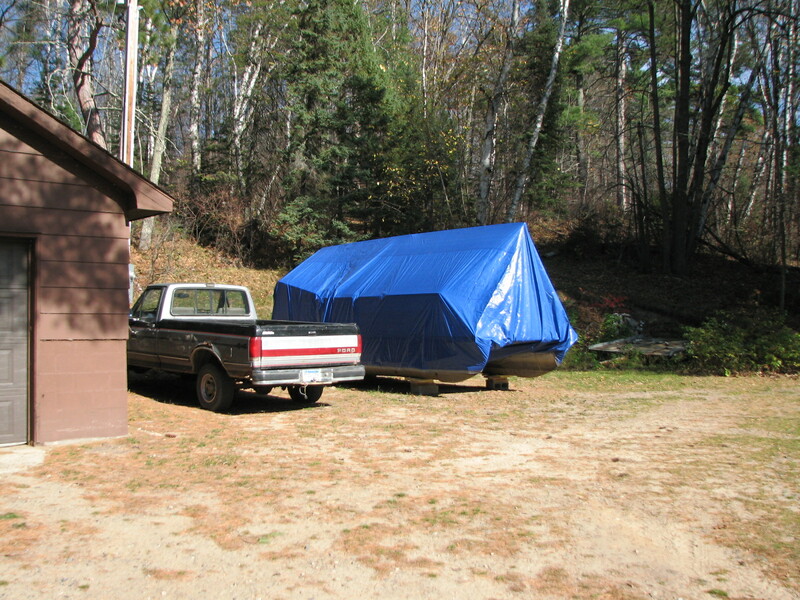 We got the pontoon out of the lake just fine but halfway up the driveway that muskrat jumped up out of the back of the boat and ran off! (I’m left with the impression that muskrats aren’t too smart.) Apparently when his first home was removed from the lake he decided that our other pontoon was a good place for the next one. 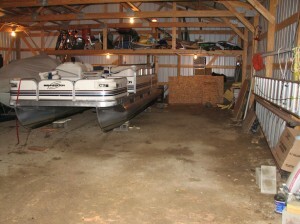 Once the varmints were out of the way we were able to get all the boats put away. I have to say that Jay does an pretty incredible job of packing our shed as full as he can get it. I don’t know if you can tell from the pictures (below) or not but there are mere inches between all those boats. Pretty amazing! 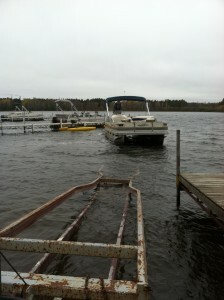 The docks will stay in the lake for a couple more weeks yet. We like to wait until it is good and cold out before we start that job. 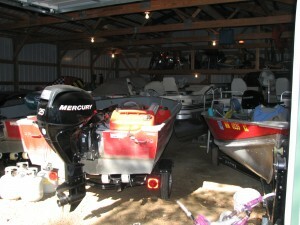 Where is the challenge in pulling docks in 70 degrees and sunshine??! 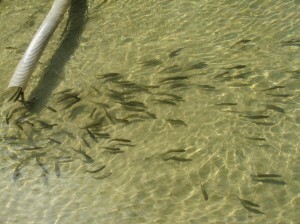 The DNR stocks walleye fingerlings every other year. 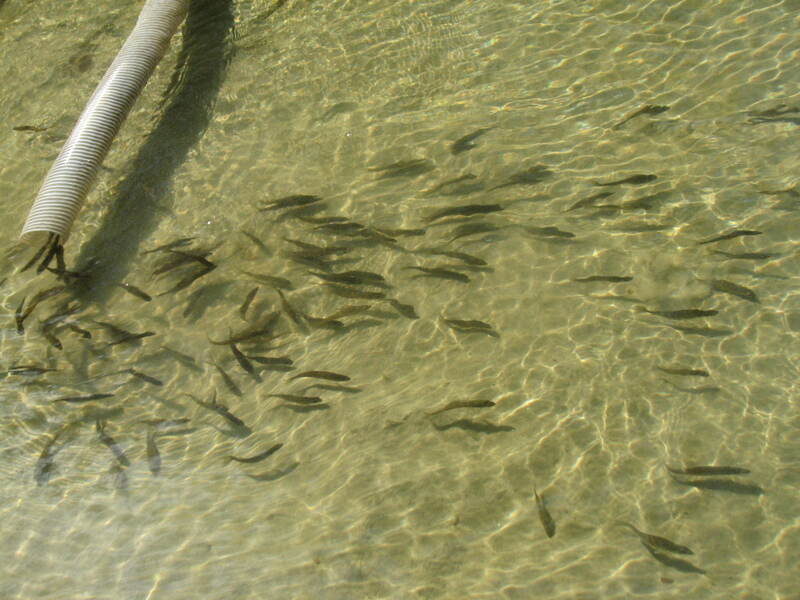 This year the Bass Lake Association supplemented the DNR stocking program with extra fingerlings. 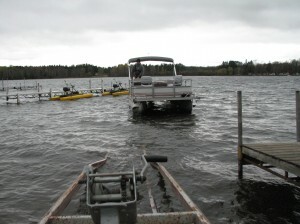 Earlier in the month we got some footage of the DNR stocking Bass Lake with walleye fingerlings. They do that every other year and this year the Bass Lake Association raised funds to supplement the DNR’s stocking with additional fingerlings. We plan to supplement even more walleye the next time (2013) the DNR stocks our lake. 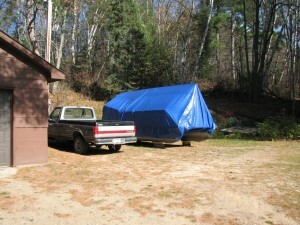 There are some great videos of the whole process on the Bass Lake Association’s Facebook page. There are lots of great things going on in our area in the coming weeks. The Reif Center has its usual variety of incredible performances including the Cab Caloway Ochestra, The Phantom of the Opera and Paula Poundstone performing for Bambi on the Hood XI. Visit their website at http://reifcenter.org for a list of performances. November marks the start of Bazaar season in our area. Every weekend there are craft sales and church bazaars. However, the largest weekend is the weekend of Firearm Deer Season Opener (Nov. 5th) when 100s of vendors display wares in area-wide craft sales. As we slowly get Wildwood ready for winter we are getting more and more excited for the next change of season. We live in an incredibly beautiful place and appreciate getting to make our life at Wildwood – muskrats and all. Enjoy these last days of autumn…winter (and snowmobiling) is on the way! It was a “little” windy the day we decided to take boats out! 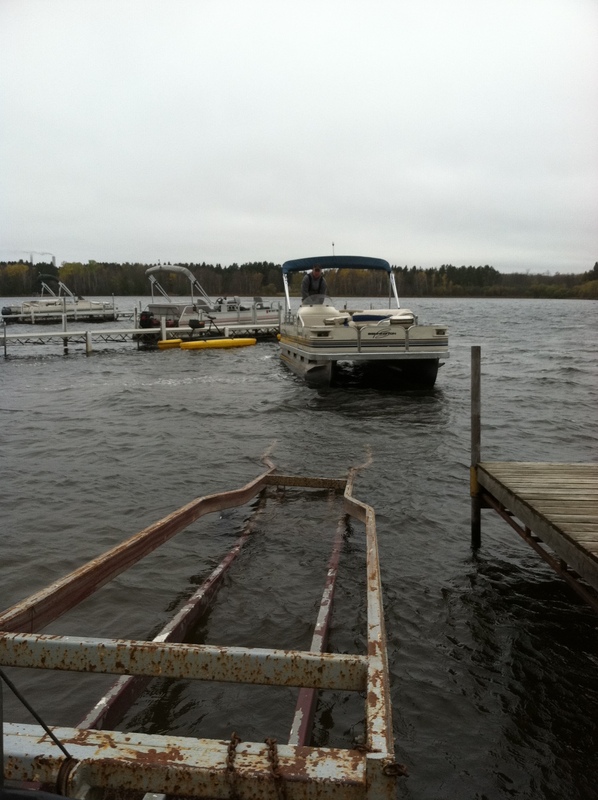 NOW we remember why we don’t use a 24′ pontoon trailer!! Doesn’t seem like enough room, does it? 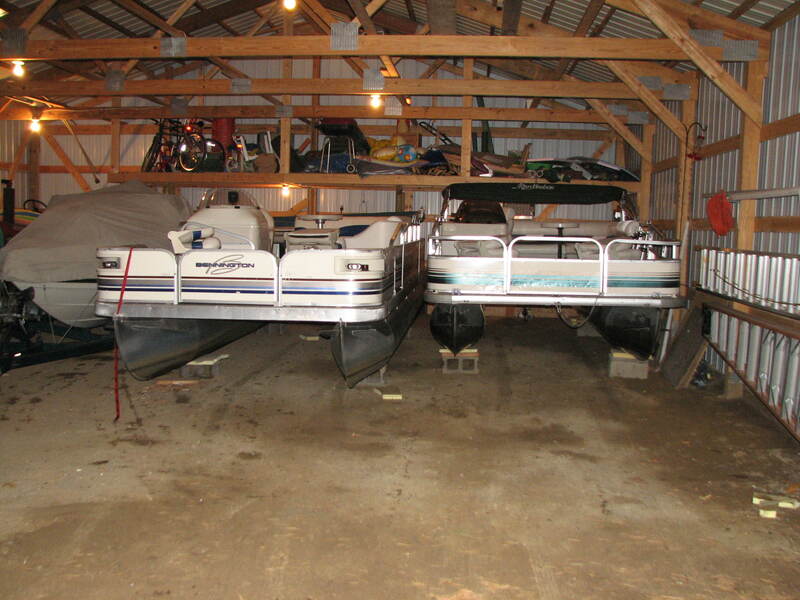 Ok – last pontoon going on the trailer. The shed is ‘almost’ full. Only about 100 more things to stick in there. With the addition of another pontoon I’m afraid one of them has to stay outside for the winter. Looks like an old covered wagon!